Bert Hickman, Stoneridge Engineering, www.teslamania.com. (Right) Ian Tresman. Simple experiments can demonstrate the principle of the “z-pinch” that electrical theorists say is the best explanation of the hourglass shape of many bipolar nebulas. As a jet of water flows, the surface tension causes the stream to constrict, and the jet forms beads or droplets (see image top right). You can sometimes see this occur, for example, in the stream of water from a garden hose or sprinkler. Chief Researcher at the Kurchatov Institute, Boris Trubnikov, noted that water beading is a good analogy of the plasma jets that are observed to pinch in the laboratory and the cosmic plasma in nebulae, too. In plasma, the pinching is due to the self-generated magnetic field compressing the jet unevenly along its length. The pinch is sometime called a z-pinch because the magnetic field lies along the z-axis, and the beading is sometimes referred to as the sausage instability because of the shape. In 1905 James Arthur Pollock and Samuel Barraclough at the University of Sydney suggested that the distortions in a length of copper piping used as a lightning conductor were due to the pinch effect. The phenomenon has also been suggested as the cause of pinching in bead lightning. The pinching of metal can be simulated in the laboratory by simply placing an aluminium soda pop can in a conducting coil of wire and sending a short pulse of high current through the coil. 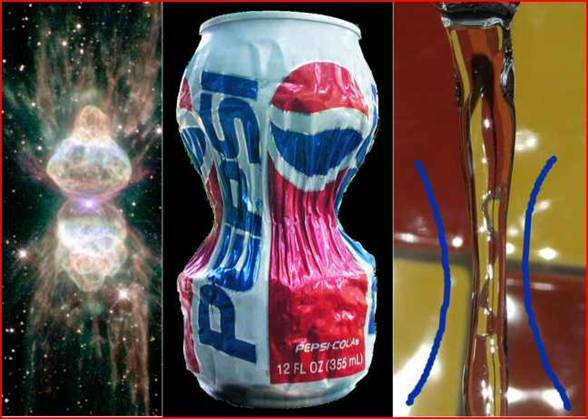 The magnetic field generated may be strong enough to crush the can, in this case producing a characteristic hourglass shape (see image top, middle). Pinches in plasmas were first investigated by Willard Harrison Bennett in the 1930s. He was able to work out a relationship between the plasma density and current (the so-called Bennett relation), and pinches are sometimes called a Bennett pinch. As cells of cosmic plasma move relative to each other, they generate currents and magnetic fields that cause them to produce jets that pinch and bead. It is perhaps no coincidence that when astronomer Walter Baade first distinguished individual stars in the Andromeda Galaxy, he described them as like "beads on a string". And the Ant Nebula (see image top left), which glows like a plasma-filled fluorescent light tube, has a characteristic hourglass pinch in its middle..
With 99% of the universe consisting of plasma, we cannot afford to ignore the obvious electrical influences any longer.